Bimat eye drops are a medication for those seeking to alleviate intraocular pressure within the eye by increasing the natural flow of eye fluids. It is used for the treatment of glaucoma patients. This assists in preventing blindness. The eye drops are also taken to treat hypotrichosis (short eyelashes). It elongates, thickens and adds intensity to their color. 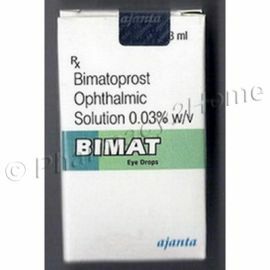 Bimat Eye Drops were originated in India by Ajanta Pharma Ltd. and their core active ingredient is Bimatoprost. Bimatoprost Latisse 0.03% is a solution belonging to the prostaglandin analogs class of medication. This works by reducing fluid content levels and raising the outward flow of fluids from the eyes, hence reducing pressure. This solution is to be kept out of reach of children as well as pregnant women. It is to be stored in a cool, dry place away from direct sunlight and heat. Bimat Eye Drops should be applied to the eye once daily (preferably in the evening to avoid contact with sunlight) or as prescribed by a doctor. To apply, hold your eye open and carefully squeeze a few drops into your eye. Then, blink a few times to help spread the liquid over the eye. In case of an overdose, consult a doctor or physician immediately for correct medical treatment. In case of a missed dose, take the dose as soon as possible. However, if it is time for the next dose, skip the previous dose and take the next dose as per original plan. Side effects are usually relatively mild and include: eye irritation, stinginess, redness, dryness, burning and watering. Increased light sensitivity and Iris discoloration may also occur. If any of these side effects persist or worsen, consult a physician immediately. Bimat Eye Drops are to be used for 12-16 weeks for maximum eyelash growth. Results are usually visible in approximately 8 weeks. However once use is stopped, eyelashes may return to normal condition. Hence, it should be used once a week after achieving desired results. If you are using the eye drops to treat glaucoma, ask a doctor as usage depends on intensity of ailment.